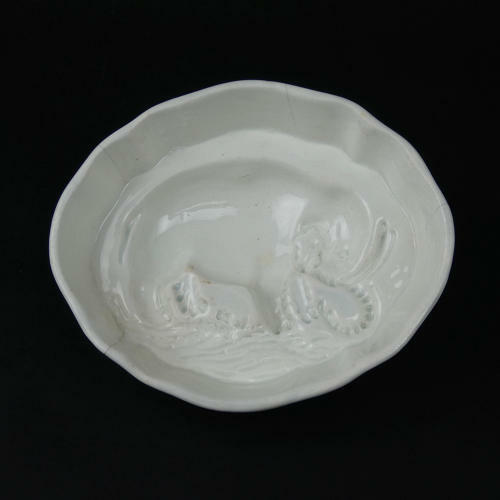 A most unusual, pearlware mould with and elephant, or mammoth, to the base. This mould is English and it dates from the end of the 18th century, c.1790. At that time many people had not seen elephants in real life so there is a lot of artistic licence in the portrayal of the animal. The mould is quite lightly potted, in pearlware, and it has a blueish glaze. There are three quite stumpy peg feet to the underside. Unfortunately there are four cracks to the rim of the mould, each one running the full depth of the rim of the mould, approximately 3cm. Price includes postage within the U.K. Shipping to the U.S.A. add £18. Western Europe add £8.